Dyer posted a message on social media earlier this month saying the couple had parted ways, but her dad Danny Dyer later said they had just had a row but were still an item. 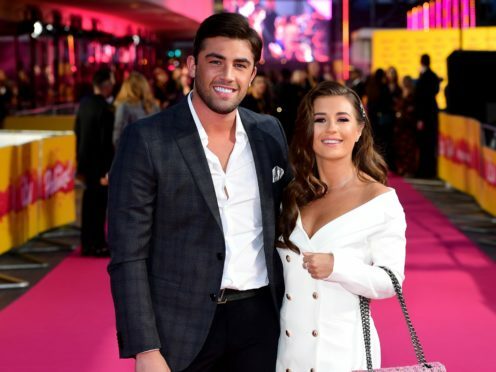 Their romance looked to be on course on Monday, as the contestants from this year’s series of the ITV2 show were reunited for a Christmas special. Fincham posted a video to his Instagram story of him and Dyer on the sofa, watching the one-off episode together. He provided a running commentary of some of the highlights, while Dyer giggled. The islanders gathered at a country house where host Caroline Flack told them they would be treated to a party and a Christmas lunch. She also suggested they iron out any tension or misunderstandings, saying Christmas was time for “a fresh start”. Things were tense between Sam Bird and Georgia Steel as they bickered about the end of their relationship. There was also drama between Ellie Brown and Charlie Brake, with Brown accusing Brake of cheating on her. He denied it, leading an upset to Brown to brand him “a compulsive liar”. As the show wrapped up, Dyer posted a message on Twitter saying it was strange seeing themselves on the programme. “Glad you all enjoyed the love island reunion so weird watching it & Thankyou for all the lovely comments glad we can still entertain ya,” she said.